Getting ready to do some baking. I never get tired of playing in the kitchen! That’s why I hauled my Kitchen Aid mixer to this little apartment, along with a few other essentials. Here are a mix of my current favorites, both savory and sweet, tools and foods. Parchment paper – what a difference this makes in baking. Easy clean up. I particularly love using parchment paper for baking brownies…leave a generous margin of paper hanging over the sides of the brownie pan and just lift out the brownies when baked. Easier to cut brownies out of the pan. When I first tried parchment paper, I was frugal, using it only for certain things. Now it comes out almost any time I turn on the oven. Silicone baking pans – I’m only beginning to use these, but what I’ve used so far I like. The added bonus: you can shape all sorts of stuff in these…handmade soap or other crafts. Multi-purpose! Cauliflower “mashed potatoes” – I’ll admit when I make this version of the traditional mash I add a little butter and sometimes sour cream to the mix…the flavor is so good I hardly notice the substitution of cauliflower for potato. Best tip: if you want a little more body to your “mash,” add a small potato or two to the head of cauliflower. You’ll still have a lower carb dish, but it will be a little sturdier…maybe a good step down from the all-potato mash. Big wide shreds of parmesan…I can sometimes find this wide shred in the grocery, usually in the specialty cheese section, but if you can’t find it, buy a gorgeous big hunk of parm and use a vegetable peeler to make your own wide, luxurious shreds to top pasta bakes, salads, or whatever needs a little more cheesy goodness. A new favorite, I’ve only recently been roasting garbanzo beans, aka chickpeas. Delicious and simple. Start with two cans of garbanzo beans, drain and rinse. Spread the beans on a cookie sheet in a single layer. Drizzle with olive oil, season with salt, pepper, garlic, cumin, chili powder, or any seasoning that strikes your fancy. Bake/roast at 400° for approximately 30 minutes. I say “approximately” because you may want them to be more or less crunchy. My advice is to check the beans after the first 30 minutes and decide if they’re done to your taste. They’re like popcorn, only better. Good for snacking, and making salads more interesting. Seattle Bakery Cracked Wheat Sourdough Bread…if you can find this brand, buy it! The sourdough flavor comes through with the crunchy nuttiness of the cracked wheat…delicious toasted with jam, or use for the perfect grilled cheese. This bread comes in a big round loaf. Beautiful. Burrata cheese: If you haven’t tried this, you must do so, asap! It’s wonderful, that’s all. My new favorite way to prepare salmon: searing. I used to bake salmon, if I wasn’t grilling, thinking it was the best way to keep it healthy. But I always have trouble with the timing. It seems like I pull it out too fast, or just past the perfect done-ness. I tried pan searing the fresh salmon we caught last weekend, and it was perfect. Just put a little olive oil or butter (ok, I always choose butter) in your pan, and when the pan is hot, place the salmon and season. I turned the fillet once, and got it just right. Not overdone, and the texture was perfect. Outside got a little color, and the inside was medium rare. Never baking salmon again! Place coconut oil in double boiler over low heat and melt. Add chocolate chips to double boiler with the oil. Gently blend chocolate into coconut oil until smooth. Let cool for a few minutes and then drizzle on your favorite anything. Perfect for dipping fruit. Bananas, strawberries, and grapes are my favorites. Made some frozen dipped bananas recently and can verify: highly edible! Also perfect for ice cream. In the digital world, check these out…well worth exploring. PicMonkey – a fun and easy photo editor…there’s a free version and a paid version, both are great. Good for creating printables or almost anything. Look here. Best way to sell online…I call it a digital garage sale. Check out your local Facebook sale site. The one for Ketchikan is called Ketchikan SaleCycle, it’s a closed group for local residents…an amazing resource if you need something, or if you’re selling. I sold most of my furniture in the move last fall, and a lot of miscellaneous household items…made over $13,000 in just a few weeks. Of course, eventually I’ll have to replace some of those things, but it was a fantastic way to sell without doing a huge one day event that might or might not have gone well. And it’s fun too…actually sort of addicting once you get going. I like it better than Craigslist. I think most communities have a local Facebook sales group. Find the digital garage sales in your area and get ready to clean out! A new favorite exercise…the Perfect Fitness Ab Carver Pro…It really works! Looking to be inspired to say “No!” more often? I can’t say enough about Greg McKeown’s book Essentialism: The Disciplined Pursuit of Less. I read it a few months ago, and I’m still drawing on it as I consider choices. I’m one of those people who finds it difficult to say “no.” Recognizing that saying “no” actually honors the real priorities of my life helps me to be strong in the face of my built-in need to please. Not always easy for this Southern girl/woman to do, but I’m trying to be more thoughtful and deliberate about my answers. RSVP Endurance kitchen products: I love these tools. You can find them on Amazon or in specialty kitchen stores. They’re not too pricey, but all the ones I’ve tried are good. Very good. This is a brand like Oxo…great value for the money, and whatever they make is quality. The tools are a pleasure to use. Hey! 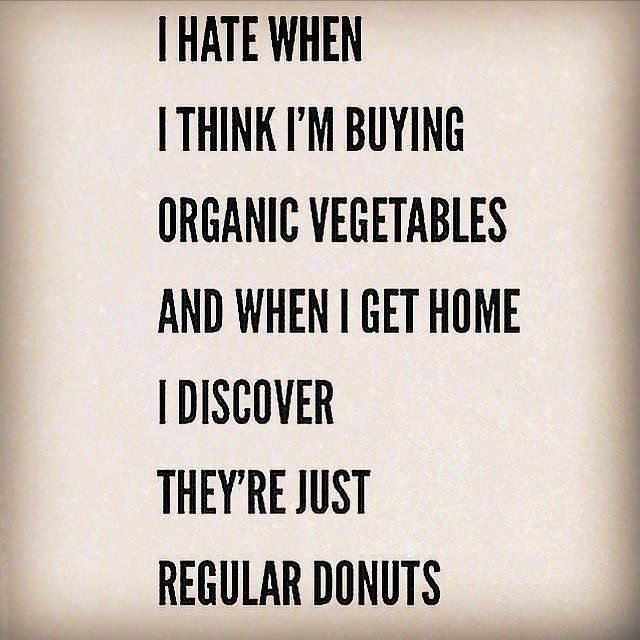 Stumbled across you blog and two things– The donut picture made me LAUGH [too relatable]. Also I love the idea of using coconut oil in lieu of vegetable oil when making chocolate covered bananas or strawberries. So much healthier! thanks for the suggestion!